Sam saves the day with the sand in his socks ... awesome !!! I looked over your blog and it looks really good. Do you ever do link exchanges on your blog roll? If you do, I'd like to exchange links with you. Finally!! i think this is a movie to watch on ur mobile or PC. BIG screen give you headaches. Too much Shaking , explosion here and there.Animations was great ILM is great doing what they do best. Bad Story, but i still remember Megan Fox ruining. Ahhhh.Happy to see Jetfire and Sideswipe. I still say don't mess with the basics. I got that same feeling when I watched the first one. I wasn't satisfied that the alien bots displayed very human qualities and mannerisms. I was expecting something very different. My son though, he absolutely loved it. It was then that I realized who the real audience was for this kind of movie. 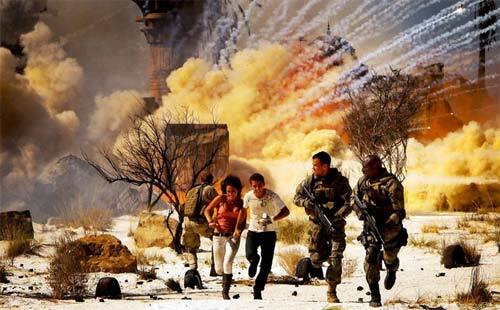 I guess Michael Bay movies are like that -- brainless action entertainment! Hope you don't mind my putting a link to your review on Baiskoaf blog. My sentiments too. Honestly, I thought the first one was over the top too. Michael Bay is, how do you put it? Wacko, on dynamite. But if you're a real die hard transformers fan, you gotta love the way Optimus kicks @#$! That being said, I think the trailer for G.I.Joe which they showed at the beginning of this movie was more exciting... you gotta wait and see how that turns out. @Simon, theres a whole new generation of Transformers fans out there now... bioshock cannons (batteries included) is the new 'buzz'. After reading your post about this movie, I see that we have totally different views upon this movie. Which is interesting.^^ And yeah, I do believe this movie is primarily made for the kids. Hence why there isn't a deep storyline or plot. awesome scenes.. I think this one and BBC's "blue planet" should be broad casted for everyone to see through the local TV channels. Maybe a translated Dhivehi one could also be produced. I couldn't have said it better. Megan Fox was there and she was hot, enough said. I totally agree, and I am a girl. Straight too, hehe!